I hate packing for camping on my bike with a vengeance. I put it off and put it off to the last minute because I know how rubbish I am at it. Despite doing it loads of time I still struggle with what and how much to take. I just do not know how to travel light. My sleeping bag is huge. I get cold easy so I need a thick warm one. I am against the use of duck down and don't have a fortune to spend so end result...big sleeping bag. So that with my blow up lilo x 2 and pillow takes up nearly all of my 30 litre Kriega bag. I also squash, and I mean squash into there my trainers, a towel, my mug, my tent light, a midge hat and my emergency supplies (tyre weld, spare levers). Big sleeping bag has to fit into small bags. Next I pack clothes, spare bike clothes such as thermals, spare gloves etc and day/evening wear. 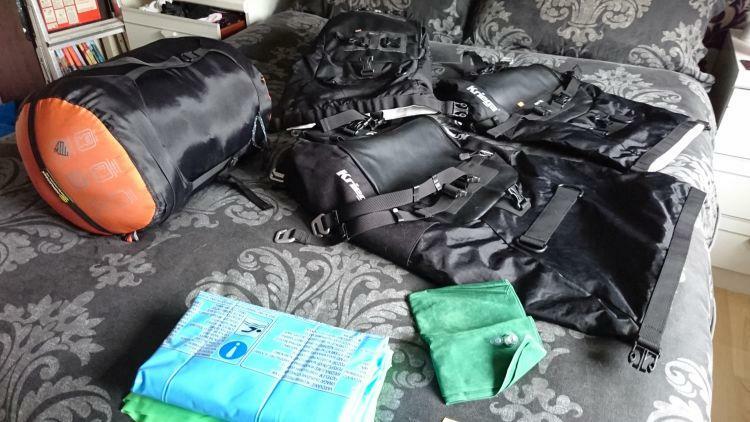 Toiletries also get packed and everything is divided into further two 20 litre Kriega bags. I am not happy, everything fits...just. This may be OK if I was staying put in one place for a week but I will be moving on every day. 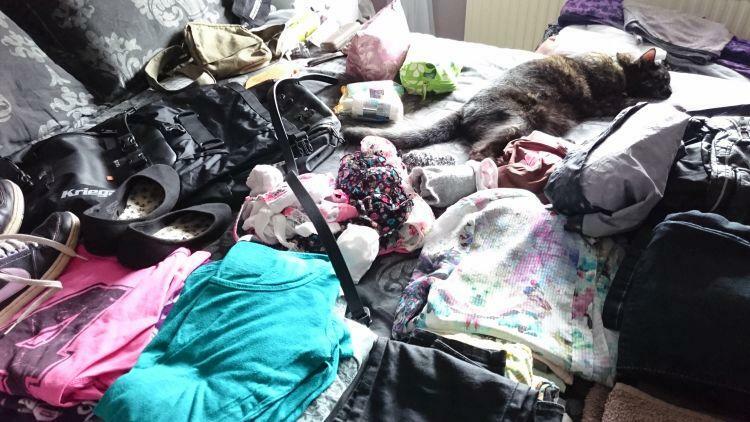 So re-packing this lot may prove problematic. One item out of place and it may all simply not fit in again. Did I mention I hate packing? I had planned to meet Ren at his mother's house the other day but I took so long packing I never made it. He came over to mine and I jumped up and down like a demented rabbit expressing my hate of packing and how it is all too tight a fit. Ren suggested a look through and a re-pack. Arghhhh he is right but, but, but..but nothing.. Time to be ruthlessness and try to lighten the load. Ren questioned my need for 3 pairs of pants rather than 2. My too numerous to mention tops and socks and my bikini...? What's the problem here, it's only an itsy, bitsy, teeny weeny, brown Hawaiian bikini. It takes up hardly any room. If you are going on holiday you take a bikini right? Even in Scotland with rain forecast and clouds of midges reported in epic quantities you know you take a bikini. NOT. I would like to pack my cat too if I could. Why a big towel when a smaller will do? You get the picture. When space is limited we have to get back to bare essentials. When weight is an issue even that little bikini, that extra pair of socks all begin to add up. Packing is redone minus the non essential extras. I feel better about it now. It feels good not to fill every single ounce of space. To have some room to breathe. Thank you Ren for your patience and not rolling me up into one of my bags.. It must have been tempting. 70 litres of luggage is hopefully all I need. With space so severely limited when travelling on a motorbike one thing there is definitely no room for are your troubles. Troubles weigh far too much to carry on a bike. My heavy sad sack mood will stay at home. Sad sack has taken up residence since my operation. I have learned through the years how to usually get rid of sad sacks. They usually only get to clutter up my place for a day or so. But this sad sack is proving hard to shift. Hopefully sad sack will have taken itself on a holiday by the time I get back. If not I will deal with it on my return and start working on how to get rid of it. Sad sack plans otherwise, it wants to come along. It plans to sneak onto the bike and become my unwanted pillion. I will have to remain vigilant because on this holiday I am determined to travel light. 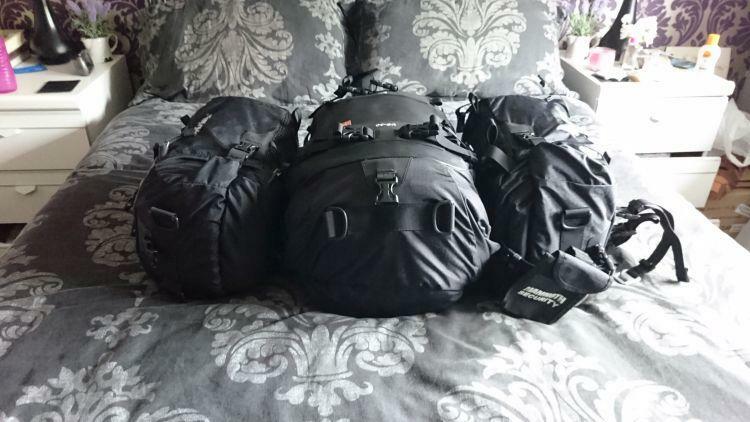 Remember my friends travelling light both physically and mentally is the best way to travel. It is not always achievable but it should always be what we aim for. How do you pack? Hard luggage or soft luggage? Do you take your mood on holiday with you? We'd love to share your own posts so if you have something to say Click Here. My wife is also terrible at travelling light and we had endless "discussions" about this when we used to tour on a bike. I think it's because she has too many clothes to start with so it's too hard to choose. As I wear the same things for every occasion it's much easier for me to just select the appropriate number of shirts / underclothes etc, ignoring colour, style etc. I disagree completely with Ren's packing philosophy. "Even in Scotland with rain forecast and clouds of midges reported in epic quantities you know you take a bikini. NOT." There is absolutely no reason I can imagine to leave a bikini at home. Even if the man has to set fire to the surrounding buildings to create enough heat and smoke to keep the woman warm and the midges away then there will be a bikini wearing opportunity. If everyone had followed Ren's philosophy when I was growing up then I would have been in my twenties before being in a place warm enough and midge free to see a woman wear a bikini. As it was Scot's girls are a hardy breed and I think we have a better midge resistance than you foreigners so fortunately I did not have to go to foreign climes just to discover bikini's. Evening wear would include a ball gown complete with tiara if Sharon had the space Ian. I on the other hand am like you - default set of clothes for every situation. Borsuk I can imagine getting to grips with young ladies in the windswept, cold and midge laden environs of the Highlands is "challenging". This however is no excuse for encouraging Sharon to pack an unnecessary item. If you wish to see her ladyship in her bikini you'll have to send her somewhere warm!!. No make that hot. Swagman throwovers that are about 25 years old at least, and a small (20 litre) backpack cargonetted over them is my preference. 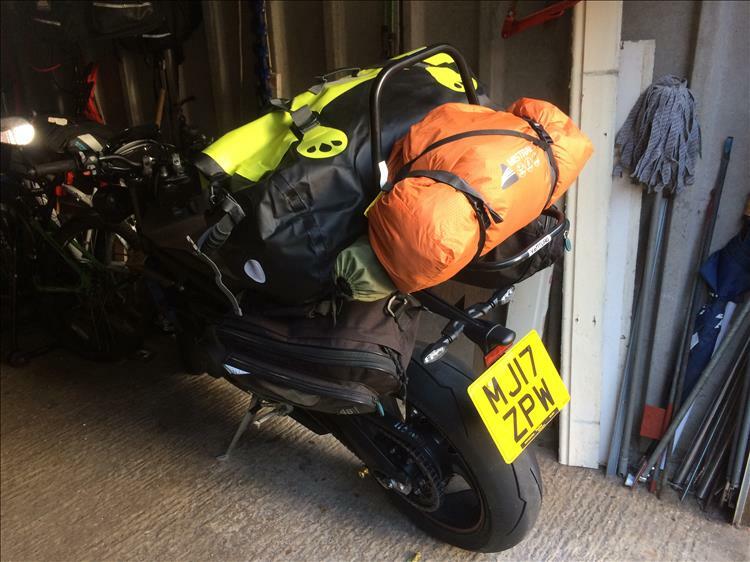 Tent sits on rack, sleeping bag, pillow and roll mat in one pannier, food and cook set in the other, clothes and toiletries in the backpack. If I need to take more, a small tank bag makes an appearance. The above pic shows throwover panniers but I have not used these yet on this bike. But of course you need evening wear, every girl needs something for a restaurant or nice posh Embassy ball...... most definitely. We could also use the cheese cloth to make our own cheese, saving money. I was hoping to ride round Scotland this year but other things have cropped up meaning the trip will be delayed until next year. I was however bothered about the packing situation as there's only so much squeezing you can do on a bike. Was thinking hostels or B&Bs might be a better option as only clothes and smellies are then needed, no need for camping stuff. I understand the need for a big sleeping bag, we tried the tiniest ones to pack away but despite all sorts of promises about the conditions they'll withstand we've found ourselves freezing. We're now onto the quite bulky pods. You have to have some comfort, right? Anyway, good luck with your trip. Could you squeeze the bikini in a jacket pocket? Yes a good snugly sleeping bag is a must for me too. I get cold way to easy. Bulk is a problem but rather that then be freezing any day. I am afraid that my pockets were already stuffed with phone, purse and keys. The bikini was not needed anyhow unfortunately. The waterproofs came in far more handy. Sorry you had to cancel plans for your Scottish trip this year. Hope you have a wonderful time however next year. You must send us some picture and let us know all about it. Have you been before? if not you are in for a very delightful revelation. If you have then as yet I have not tired of the place so either way I am sure you will have a most excellent adventure.